You wash your dishes, your clothes and your car – but what about your house? Your home is your most valuable asset, however dirt, mould, cobwebs and pollution can make the exterior of your house look old and tired. Outdoor Cleaning Specialists can help. 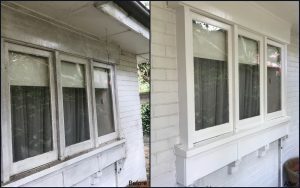 Our professional house washing Sydney service cleans and brightens the exterior areas of your home, including windows, doors, frames, gutters, eaves and fascia boards. Regular house washing also helps maintain the quality and integrity of exterior surfaces, helping to extend their life. This is particularly crucial in coastal areas, where the damaging effects of corrosive airborne salt deposits can cost you significant amounts of money. Real estate agents regularly use our house washing service to help maximise the sale price for their clients. House washing can restore your home’s exterior to a ‘like new’ appearance for a fraction of the cost of re-painting, helping to enhance street appeal when potential buyers come for an inspection. Our house washing service can also rejuvenate your awnings and shade sails by removing built-up dirt and grime. We use a soft washing method with our own specially formulated, non-abrasive cleaning solution to gently clean your awnings and sails. Looking for professional house washing Sydney?